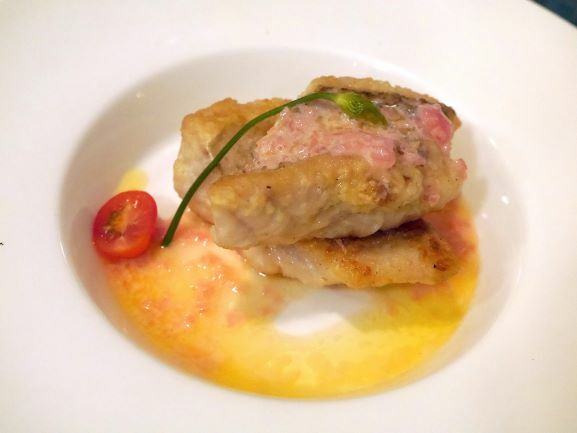 Chez Gaston Whips Up Amazing Yet Affordable French Cuisine! Home Features Chez Gaston Whips Up Amazing Yet Affordable Traditional French Cuisine! Skyscrapers and the Bangsar LRT station line up on one side of the road. On the other side, shoplots, mostly food vendors, go about their daily business. 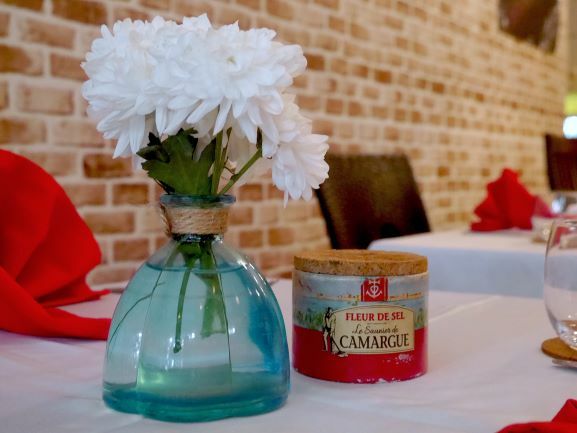 Within these shoplots, tucked away is a hidden gem of a French bistro. 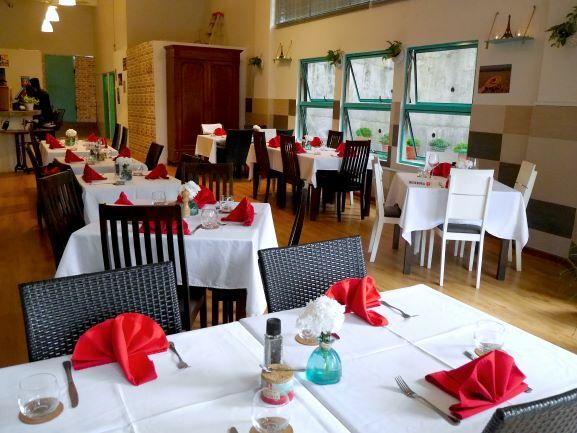 Welcome to Chez Gaston, a cosy restaurant serving delectable traditional French cuisine at affordable prices! To our delight, we were invited to Chez Gaston to sample some of their food, and to speak with the chef-owner, Florian Nigen. Otherwise fondly known as Chef Flo, he wowed us with his amazing vision of his beloved restaurant. Chef Flo has been in the F&B line for quite some time now, as he previously co-owned Rendezvous with a French business partner. When his business partner went back to France, they sold the restaurant as Chef Flo couldn’t handle the heavy workload. Not only did he have to cook, but he had to make sure things went smoothly at the upstairs lounge as well! Therefore, he decided to open a smaller restaurant to his liking – very traditional French, and named after his grandfather Gaston. Initially, he wanted to call it Chez Flo, but “Flo” is a large brasserie chain in France, and the name may cause confusion, since he has nothing to do with the large group. Passion for food and cooking clearly runs in his blood; Chef Flo’s father has been running a restaurant in France for the past 35 years now! It was clear to us that Chef Flo loved his homeland fiercely; the interior was decked out with French-style decorations minimally, but when he spoke of his vision for his restaurant, we could feel his passion. At the moment, the restaurant only has a few tables, and fits a maximum of 35-40 people. We saw a lot of boarded up space decorated tastefully with wallpaper, and behind those “walls”, construction and decoration is ongoing. First of all, Chef Flo wants to create a family area, complete with plush sofas and a TV. 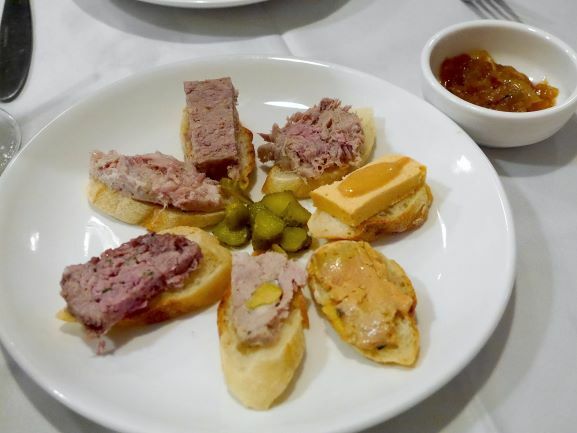 Next, he also plans to have a French marketplace area to sell French wine and his homemade pate, which was the absolute bomb! 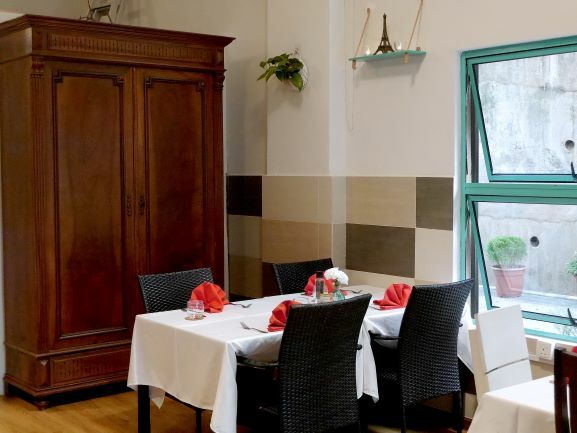 As the restaurant is a corner lot, he plans to transform the corner terrace into a cosy al-fresco dining area, and even plans on installing small iron-railing balconies. If you can’t go all the way to Paris, you can try this out first! 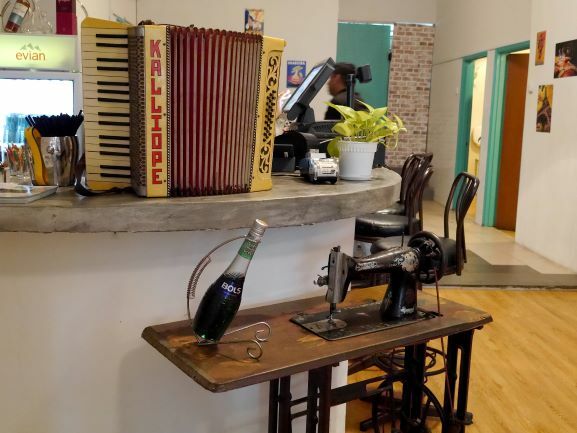 Inspired by previous visits to French bars, he also plans to have a pinball machine and foosball corner! As he spoke, we already felt like Belle waltzing through the little French town in Beauty and the Beast! When asked about his specialty, Chef Flo started off by recommending his homemade blood pork sausage and pate, of which the latter is not common in KL. After a while, he added salmon terrine, Mediterranean fish soup, homemade foie gras, beef bourgeignon, and wild boar stew to the list. He laughed and told us he’d probably recommend us the whole menu, for one very simple reason. A selection of homemade pates; Chef Flo’s pride & joy! 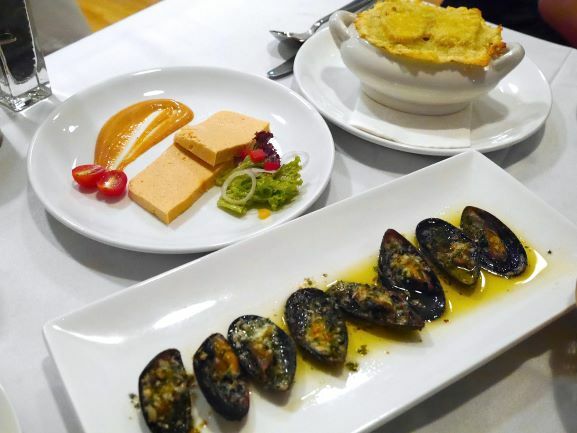 For starters, we had the baked mussels, homemade salmon terrine, and the French onion & bacon soup. We highly recommend the soup! Seabass “au safran”; we couldn’t figure out what the pink topping was, but it was pulpy and just a little bit sour, adding a kick to the fresh fish! 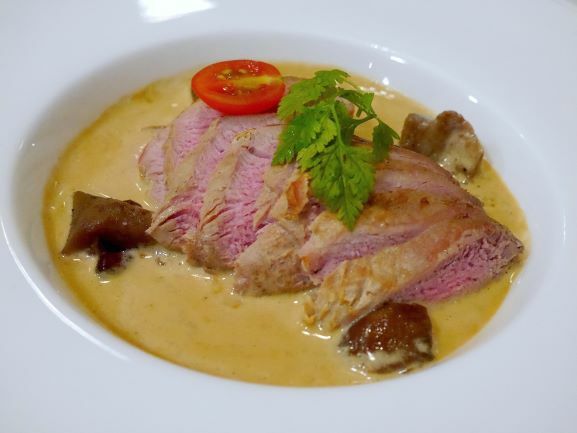 Slow-cooked pork tenderloin in mushroom porcini sauce; honestly they could bottle the sauce and sell it just like that – it’s amazing! 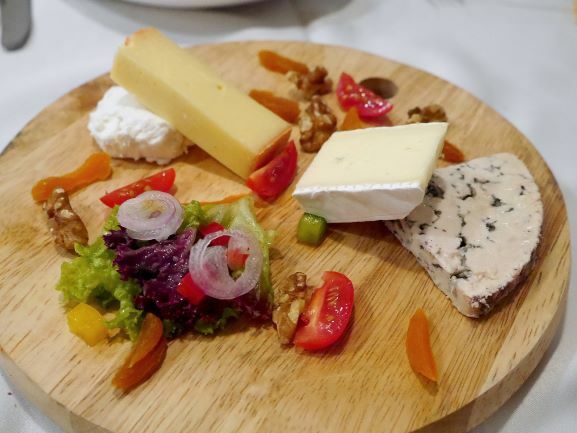 The cheese platter with a selection of four different cheese. 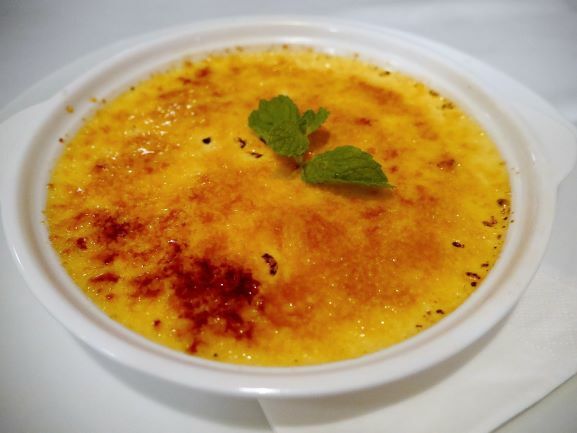 Are you really eating French food if you don’t get the creme brulee? 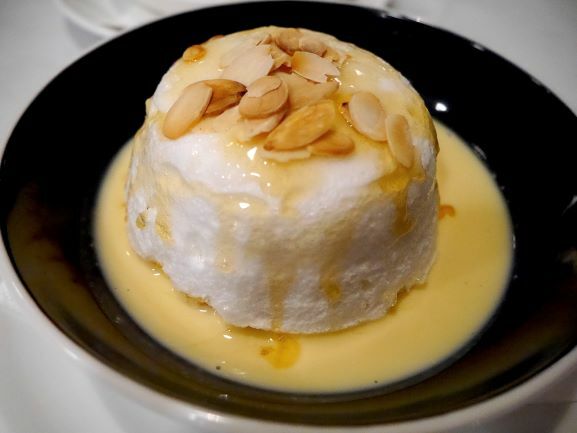 The decadent Floating Island; if you ever wonder what eating a cloud is like, it’s this! Most people readily think of fine dining when French cuisine is mentioned, but Chez Gaston is breaking that stereotypical belief. The French do enjoy their food, but in France, you don’t fine dine everyday either! Rich and flavourful, Chef Flo’s traditional French food is guaranteed to whet your appetite and leave you craving for more! Furthermore, Chef Flo practices the concept of affordability and good service. With a combination of these two aspects, customers are more likely to return, and bring their friends and family with them. Incidentally, that is his priority – to provide good food and good service in a cosy environment for people to bond. When Chez Gaston first opened two months ago, the hardest part was actually telling people that they’re in business. Plus, due to its hidden location, many barely noticed this gem of a place! Now that people are hearing about it, business is picking up swiftly, and the new challenge is to move forward and cope with the booming business. It’s a little challenging as Chef Flo is more than just a chef – he’s a grocery shopper, furniture buyer, and interior designer among other things – he does it all by himself. However, Chef Flo doesn’t let that deter him, and says that he will just do a little each day. It’s all very exciting, and you’ll find the restaurant different every time you revisit! It was a great experience with French cuisine for us at TallyPress, and we would definitely be going back for more! Tip for those working in/around the UOA building, they’ll be serving breakfast very soon, so stay tuned for that! Also, Chef Flo creates a surprise value lunch set every single weekday (except for public holidays), so do try them out, because you’ll never know what will lunch of the day be!